Grapes is a non-tropical fruits. Grapes is also known as a multifunctional fruit, because grapes not only can be eaten directly, but grapes can also be used to make jams, juices, wine, and others. Grapes has so many varieties, but there is one varieties that know as the most expensive grapes varieties, That is a Ruby roman grapes fruit. 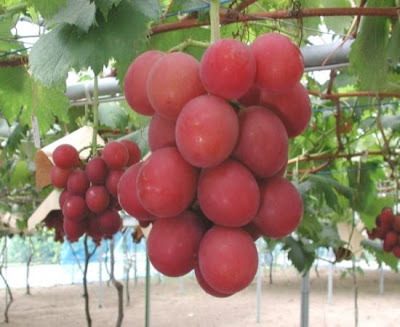 This Grapes is the result of research biologists from Japan, it has a fairly large size, almost equal to the size of ping pong balls. This Grapes went on sale around August 2008 for $ 910 per 700 grams, that means about $ 26 per piece. This price is reasonable, because this Grapes has a very good quality, low sugar levels, only about 18% but it's still very sweet.